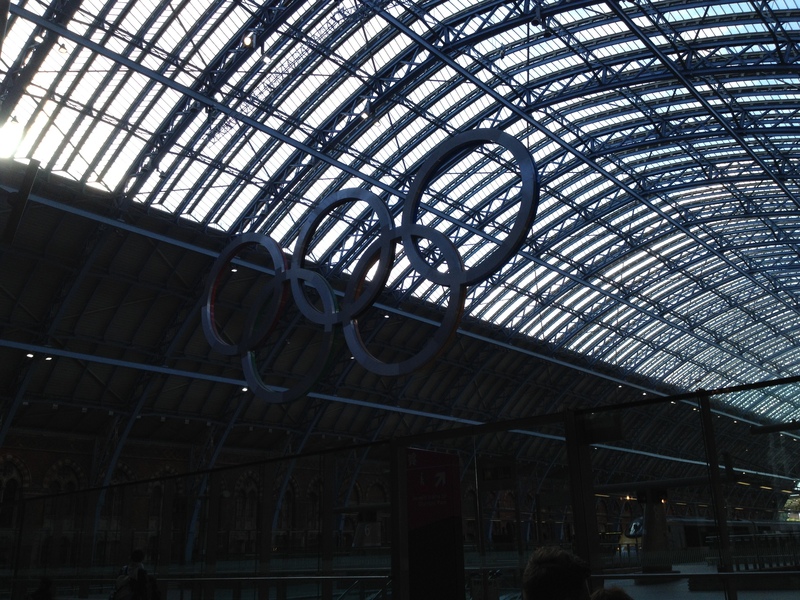 St Pancras International getting into the Olympic spirit. After the Olympics threw up such a stunningly golden day for Great Britain, I was full of anticipation leading into the event that I was due to attend on the Sunday afternoon. I was also pleased to know that if the previous day was anything to go by, my public transport fears would also be well and truly allayed. Setting off from Croydon, I decided to take the scenic route to the ExCel Arena. The Olympic organisers had been trying to discourage people from using London Bridge Station after identifying it as a hot-spot for potential congestion, but ignoring this advice, i was pleased to see that it wasn’t too full at all. Quickly diverting to the tube, the Jubilee line took me efficiently to North Greenwich, and it was at this point I realised just how well planned the whole event was. Every route map of the City, in tube carriages, at stations, on buses, had all been replaced by new ones highlighting (in the Olympic brand purple) where to go for every Olympic venue. This must have been a mammoth undertaking and no expense was spared; these weren’t just stickers over the top of existing maps, every last one had been re-printed and replaced. Secondly, Olympic ticket holders had all been supplied with a Travelcard for use on the day of their events. This one gesture probably saved hours upon hours of confusion and queuing, preventing tourists from having to try to figure out for themselves which ticket they needed to travel across town. A simple touch but one that no doubt worked a treat. On arriving at North Greenwich I made the decision to try the new Emirates Air Line. A £60million, one kilometre cable car trip over the Thames, the Air Line links the Greenwich Peninsula with the Royal Docks. Originally, it wasn’t intended to be ready for the Olympic Games, but as it provided such a handy (and gimmicky) route straight to the ExCel, I scanned my Oyster card and boarded a pod. Departing every 15 seconds, the cable cars take passengers over 90 metres into the air, showing them stunning views across the City. Admittedly on this particular day it was a little moist to truly get a clear view, nevertheless it proved to be a quick and thrilling route to my venue. Despite knowing it was unlikely that Team GB had an athlete capable enough to enter into the Greco-Roman wrestling tournament, I still looked forward to seeing something that won’t often be seen on these shores in my lifetime. The venue itself is absolutely enormous, and needed to be whilst playing host to so many spectators watching all forms of martial arts as well as boxing and fencing among others. My tickets allowed me to see the 55kg and 74kg wrestlers compete across three mats in the ExCel’s North Arena 2, and after a brief run through of the rules and regulations, it was all systems go. Initially baffling, the first round saw three matches being competed simultaneously, so it was tricky to focus on one individual or match up. Nevertheless, you were soon warned to interesting goings on in another bout by the crowd’s roar and so the frenetic action was easy enough to follow. Progressing quickly through to the quarter-final matches where only one bout occurred at any one time, I was then pleasantly surprised to see that in a change to the published schedule, the semi-finals were also going to be part of my session. The crowd in these later matches started picking their favourites and really hollering them along, whether they were old or young, British or Hungarian, there was a great atmosphere and a true Olympic spirit. After the matches had finished, we were pointed efficiently towards public transport routes and I picked the Docklands Light Railway to get back to Bank from where I could get the tube towards King’s Cross. Sitting at the front of the driver-less DLR, I was reminded of how long it had been since I was last a tourist in our capital and also how much the place now has to offer with iconic sights everywhere. After a couple of quiet pints of Suffolk cider in The Betjeman Arms in St Pancras International Station, watching the Eurostar trains come and go, I meandered to Euston and headed home, thrilled with every aspect of my first and maybe only Olympic experience. So far, criticisms of the Games have come from all sources. Some say the events are elitist niche sports which the every-man on the street couldn’t possibly aspire to be a part of. I can’t disagree more on this; anyone can walk, run and even jump if they put their mind to it and if they put enough hard work into being the best they can possibly be. I agree that fencing and dressage may be a little pricey for the average punter to take part in, but that hasn’t hampered my enjoyment of watching events unfold at all. I can honestly say that I will be sad to see the end of these Games. They may not have been as flashy as Sydney or Beijing but by God they’ve shown what Britain can do, both on and off the track. This truly is something for us and our children to be immensely proud of for many, many years to come. I still remember where I was when it was announced that London had been awarded the 2012 Olympic Games. It was Wednesday 6th July 2005, and I was about to be made redundant from my job. Topping that, the very next day, some idiots decided to set about blowing up half of London’s transport network. As much of a juxtaposed euphoric high and terrible low as you can imagine, suddenly the enormity of what London was taking on became clear and the seven years to play with almost didn’t seem long enough. Fast forward to 2011 and after the police shot dead Mark Duggan, riots erupted in the capital and across the country. One year away from the Olympic Games and England had become some sort of feral wasteland. Surely there was no coming back from this? I’m proud to say that the country would not be beaten. The British media have desperately tried to destroy the event before it even kicked off, claiming Danny Boyle’s opening shindig would be too ambitious, that the weather would be the worst in human history, and that security would be abysmal. I’ve debated with many (including Doctor Who companion Peri, via Twitter, randomly) whether these stories are truly in the public interest or whether the press were just desperate to derail the games and give themselves more headlines throughout the month. I for one truly believe that media and public alike should unite behind such a once in a lifetime event, and at this point, I’m pleased to report that all of the media scaremongering hasn’t proven to be true. The only headlines we have been seeing are about the fulfilment of golden dreams. I admit that the event hasn’t been without its teething problems. I’ve been to four Olympic football matches at Old Trafford and have seen some shoddy organisation. From slow moving frisking queues and rammed trams through to the unforgivable lack of pies before half the matches had even kicked off, you’d expect better. Even so, the atmosphere at the events has been nothing short of electric, and these specifics appear more the fault of Old Trafford and Metrolink (who really should know how to cater for large crowds) rather than the Olympic organisers themselves. But football 200 miles from the main event isn’t really what it’s all about and this weekend I was privileged enough to journey down to London to soak up some of the Olympic buzz. And what a weekend to do so. The event for which I had tickets, the Greco-Roman Wrestling, was on Sunday, so I decided to travel down on Saturday morning. The Virgin train was typically rapid and pulling into Euston at midday I could already see the huge number of purple-shirted Olympic helpers, pointing punters in the right direction with a smile and a giant foam hand. 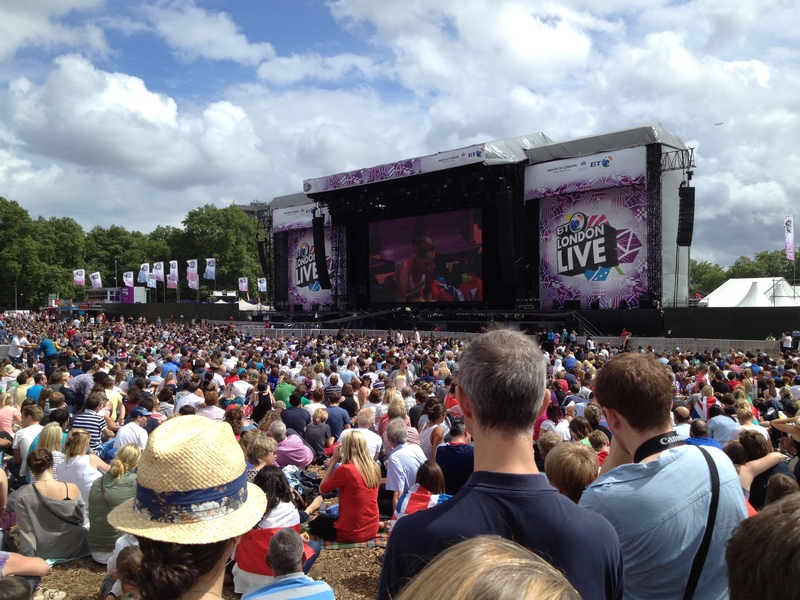 My intention was to head towards Hyde Park where the BT London Live event was showing loads of the action on multiple big screens, mixed with some live music and special guests. Knowing that the triathlon had taken place in and around Hyde Park earlier that morning, I was dreading how awful and crowded everything was going to be, but getting the tube from Russell Square to Hyde Park Corner was effortless. Straight away, you could see how much thought had gone in to moving people around quickly and efficiently. Regular readers will know my thoughts on how the general public can be zombies at the best of times so it was pleasing to see that megaphoned transport workers were ensuring all spaces were filled and that people kept on moving, all the while keeping a smile on their faces. Getting to Hyde Park, I had to wait to cross a couple of inner park paths whilst cyclists zoomed through but again, the crowd control workers were friendly and chatty, making the experience far more pleasant than it had any right to be. Arriving at the gates to the Hyde Park event I was again filled with dread at the prospect of queuing for hours to get through the airport-style security. I had my man bag with me with all manner of weekend essentials inside; iPad, tail shine, bullet belt. Yes, I was one of those people they really hate when it comes to prohibited items and general idiocy. But once again, all fears were unfounded. I found a queue that was short and the guys and girls on the gate were polite and friendly, allowing me to nip through the scanners in no time at all. It was a gloriously sunny day at this point, made all the more wondrous by the buzz around the park. Although not as full as it would be later that night for the big athletics finals, the crowds were certainly gathering and picking a decent spec was tricky. Eventually we plonked ourselves on a picnic table next to one of the screens and took in some tennis and hockey whilst relaying beers back to the group from one of the nearby bars. Once again, the refreshment side of things was where the organisation was let down a little, as despite beer pumping machines churning out 20 pints at a time, the tent always seemed to be devoid of Heineken and the staff appeared to be more interested in flogging souvenir cups than any actual liquids. I found out later that they had a competition going to see who could sell the most cups, which wasn’t really in the spirit of the whole event. Nevertheless, with careful queue picking, getting a little snifter in wasn’t too tricky (but was pricey) and as the sun shone down on us and our new multinational friends (hello American lady and random table of Dutch folk!) we soaked up sports from all around the event, checking in for golds over on the cycling screen, a live appearance on stage from Sir Bradley of Wiggins and even a set from snotty upstarts McFly. Having over-indulged in sun and shenanigans it was time to head out to my accommodation and once again, all was well. A short walk to Victoria and a train to East Croydon was simple, and with every stop the news of further medals kept the atmosphere electric.